Since we returned from Melbourne in May we have spent a lot of time in remote parts of northern Australia enjoying the bird-life. In recent weeks we have pondered over the fact that it is almost twenty years since we had a “first for Australia” and that was a Blue and White Flycatcher on 5th December 1995. We have seen some amazing birds on our travels and every trip is special regardless of what you come across. 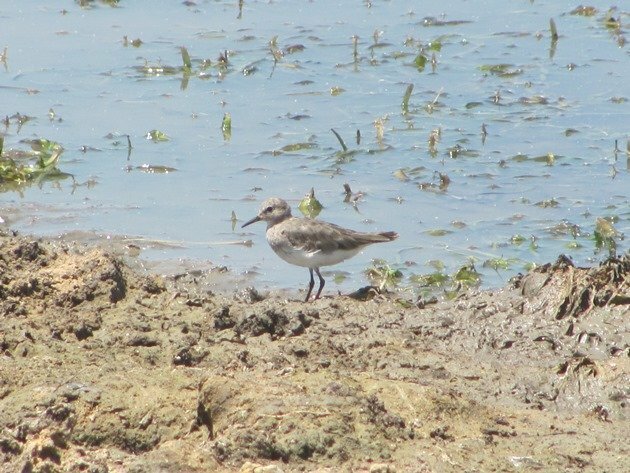 Our latest trip this weekend found us two metres from a small shorebird that immediately struck us as a shorebird that we do not see in Australia. 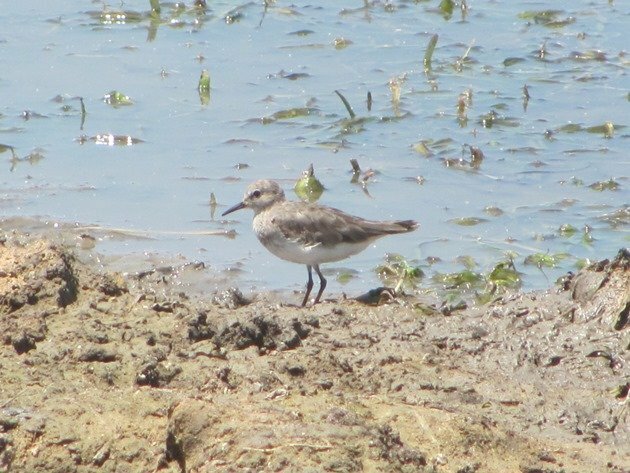 It was particularly small just like the Red-necked Stint and Long-toed Stint that we are familiar with, but with plain plumage and definitely did not have long toes! 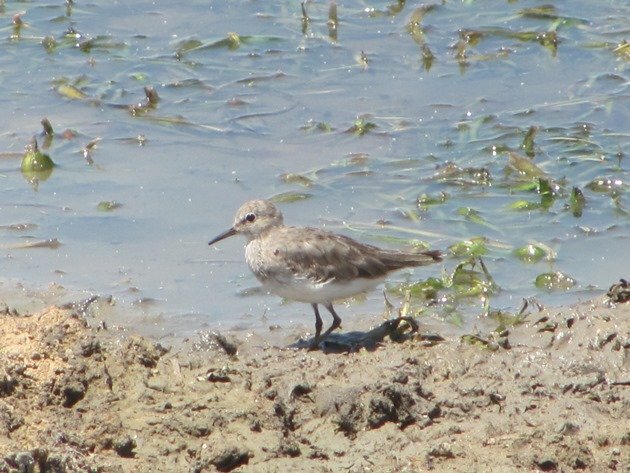 When you have spent as many hours looking at shorebirds as we have you just know something is not quite right. It was busily feeding only two metres from us and this is where my compact camera was aimed at it and several photographs taken as we both questioned what we were looking at. 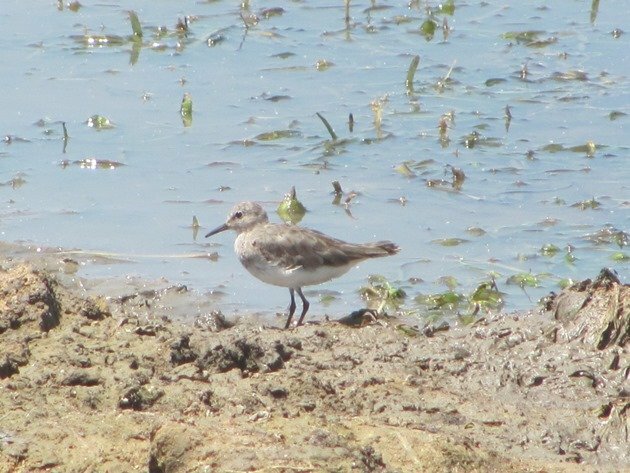 Grant spoke to another birder by phone describing the small bird and when asked if we had our scope with us Grant pointed out that it was actually too close for binoculars let alone a scope! 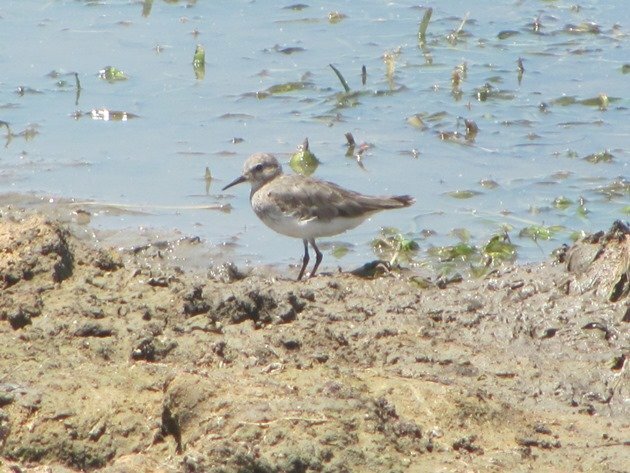 The leg colour was rather tricky due to the shadow from the sun, but it was not black and more of a yellowy olive colour. 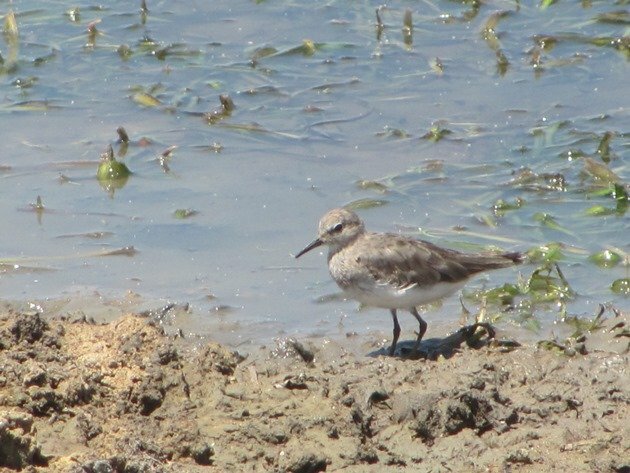 We believed we may have found a first for Australia in a Temminck’s Stint, but it is very hard to be confident and the photographs were sent to a member of the Birdlife Australia Rarities Committee for confirmation of what we believed we had observed. Of course, you don’t say what you believe you have, but you ask for an opinion! There is nothing nicer than a “Congratulations on a first for Australia”!! 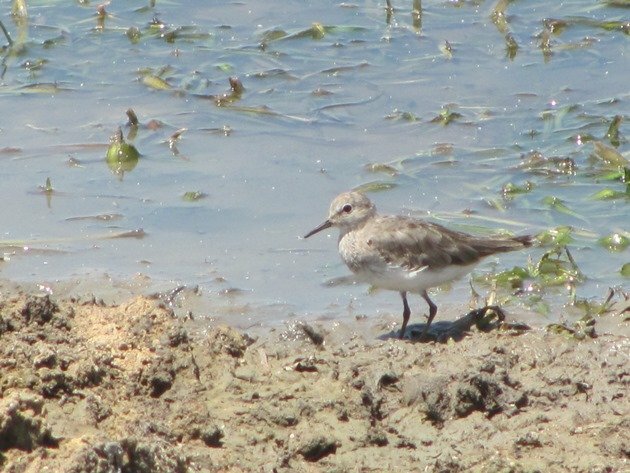 Of course we do now need to do some paperwork and submit our record officially with all the relevant notes about the find, but meanwhile I will show you some of the photographs that were taken at very close range with a small compact camera of a Temminck’s Stint in north-western Australia! We have not slept much after such an exciting find, so please excuse the brief post one day after my last post! 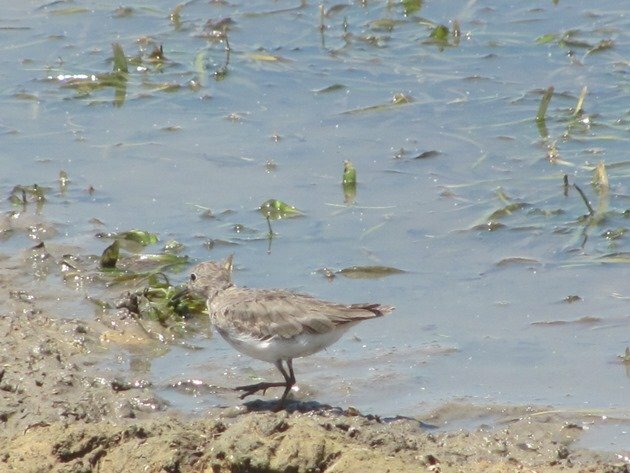 Don’t worry….this is the best bird of the weekend and the year! 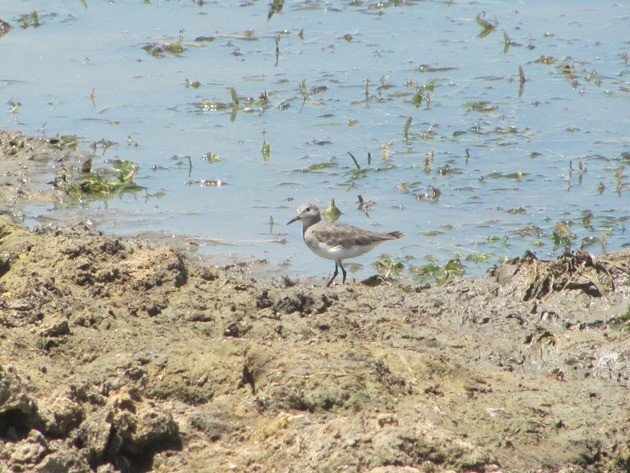 So, it has taken almost twenty years to find another “first for Australia” and it is a big continent and there are some great birds to be seen, but maybe with all the time we spend outside we may not be waiting until late 2035 to submit another rare bird to the Birdlife Australia Rarities Committee!!! 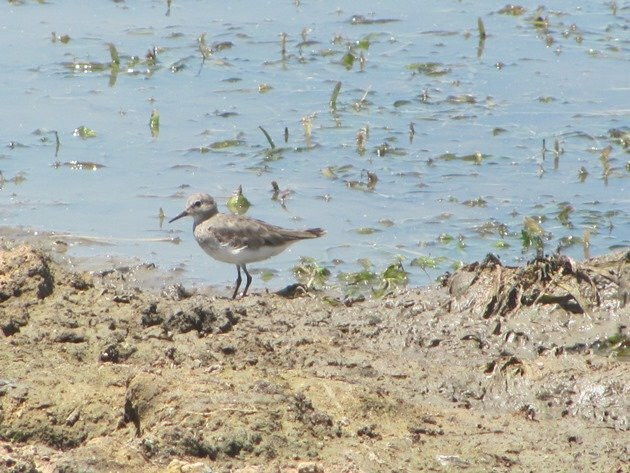 UPDATE:- This is BARC case number 893, because the rarity has formally been submitted to the Birdlife Australia Rarities Committee. The area has now seen heavy rain and is no longer accessible by four-wheel drive! 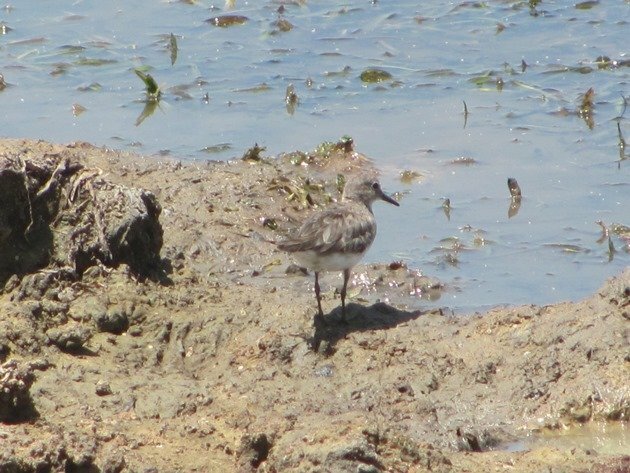 UPDATE:- This record has been accepted unanimously by the Birdlife Australia Rarities Committee dated May 6th 2016. Congratulations, Clare, that’s a major discovery! Congratulations Clare! What a cool achievement — and what a pretty bird, too. You just might top all of our Birds of the Year! Congratulations, Clare! What an exciting event to find the first of that species on your continent. Wow! Wow, what a find! It does look like one. I assumed that it was already on the list for Australia. Congrats! It is now! Subject to being accepted of course….but when a member of the Rarities Committee congratulates you I think you are pretty safe! Looks fine to me. 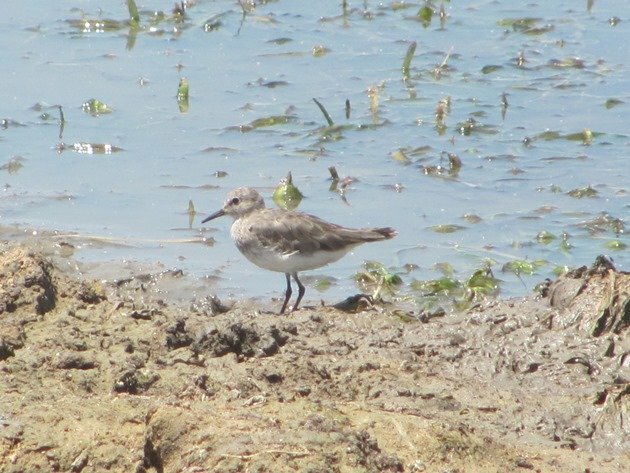 The legs appearing dark isn’t a big issue since they often are stained by the mud, and it seems from my experiences here in Europe that especially Temminck’s are prone to getting their legs muddy. Also, they don’t appear to be pitch black, which suggests even more that they are indeed pale. Sorry to disappo9nt you, but I actually sent a Bearded Vulture your way. No idea where the mix-up happened, but you may want to scan the sky on occasion. 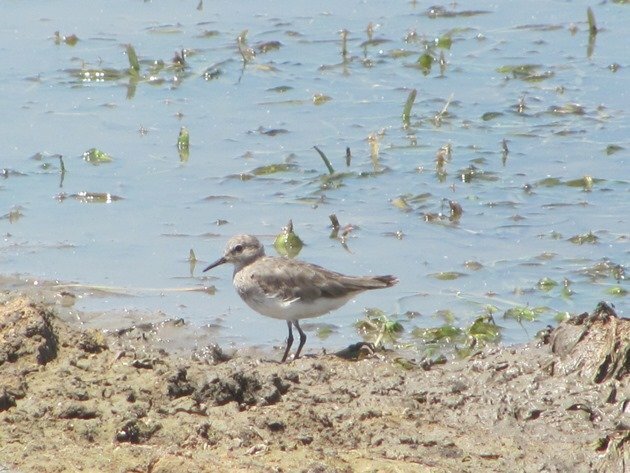 Where Are You Birding This Final Weekend of July 2017?